Buyer closing costs on the purchase of a home vary from State to State but they can also vary depending on the kind of home and where it is located within the State. Buyers initially tend to focus on the purchase price of a home. We think it is equally important to understand the cost to go to settlement and the ongoing costs of living in the community. 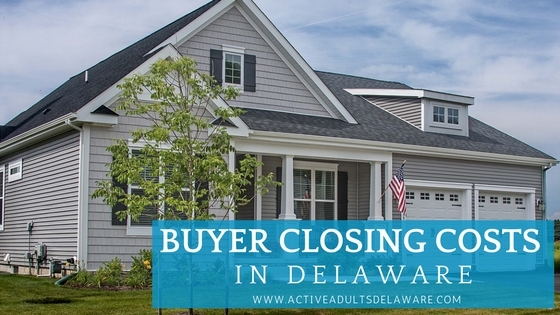 In Delaware, the Transfer Tax is the largest portion of your closing costs whether you are buying an existing home or new construction. The Transfer Tax is 4% of the total purchase price of the home. It was increased from 3% to 4% at the end of 2017, so be careful if you are doing online research; it is always important to check the date on the information you find there. For example, I recently came across an article I wrote in 2015 showing the Transfer Tax at 3% that was also published in the Cape Gazette on July 22, 2017. I have since updated the post because most of the other information is still accurate. The post is a good overview of what ends up on the Seller side of the transaction and what costs are born by the Buyer, give it a read. When you are buying a resale, the Transfer Tax is customarily split between the Buyer and the Seller at 2% each. But, when you are buying new construction, not all builders split the Transfer Tax or make any contribution to your closing costs. Each one has a different policy and the agents at Active Adults Realty make sure our clients get the whole picture before making a purchase decision. Fees charged for the type of mortgage you are using to purchase your home. If you are using a VA loan, the fee can be as high as a 3% funding fee. This fee can be financed or it can be paid for by the Seller. There could also be a Loan origination fee. I have seen numbers like $895 on loan amounts in the low $300s. CAP (Capital) Contribution – This fee can range from $500-$6000 or more, depending on the community and the amenities. This fee goes into an escrow account as required by the State of Delaware. If a community purports to provide certain amenities and services, it must document it is collecting sufficient funds to do so. They do that by collecting this CAP Contribution at settlement and then collecting monthly or quarterly dues. Active Adults Realty will make sure all of this is disclosed while you are evaluating your options. Impact Fees – Impact Fees are typically collected at settlement. Impact Fees are only collected from the first purchaser; if you are buying this home at resale, any impact fees have already been paid. These fees reimburse the developer or the town or county for expenses related to infrastructure or services like water and sewer. These fees can vary greatly depending on the community and its location. Is the community connecting to a town or county sewer and water system or is it on a private community system? These are important questions when evaluating the cost to settle and the cost to live in a community. Special Taxes – Some communities recover the cost of improvements and infrastructure via a Special Tax. This is a tax added to your county, town, or city property tax for a period of years—typically 20 or 30 years. If you purchase new construction, the clock begins on your settlement date. However, if you purchase a resale home that is 10 years old the remaining time could be far less. 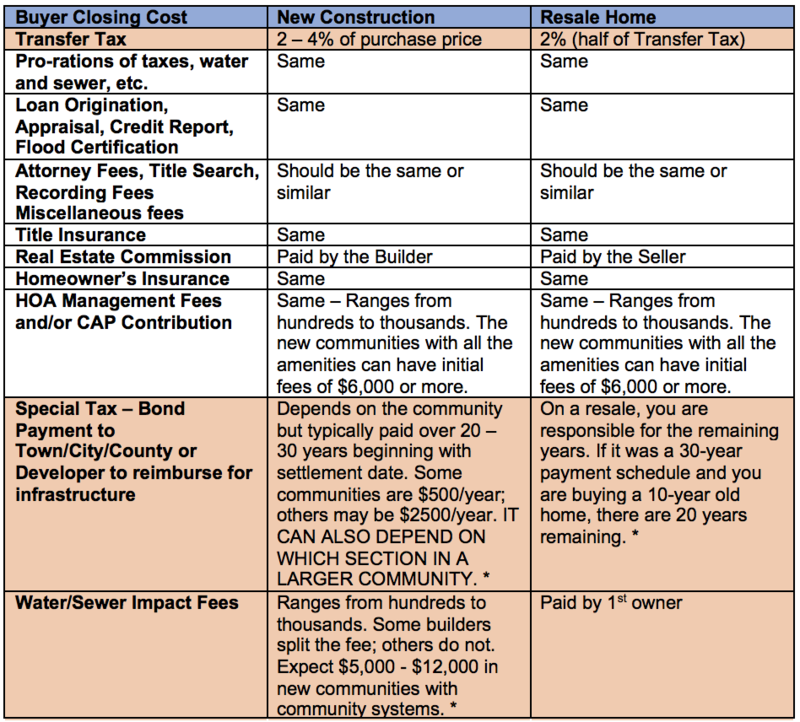 Use this chart to understand the different closing costs for new construction versus a resale. * Every community is different and things can change. Please ask your Active Adults Realty agent for the details. As you can see, the difference in closing costs between buying new construction and buying a resale can be significant. As a rule, you should expect 3-5% for closing costs on an existing home. For new construction, we estimate 4-6% but it can be higher for communities with a country club lifestyle. There can be a financial advantage to buying a “newer” resale home in a community where you also have a choice of buying new construction. When you work with a Buyer Agent from Active Adults Realty, you will have an advocate—an ally—someone on your side to help you make an informed decision. Are you ready to get started? Request our Free Buyers Guide, email Broker@ActiveAdultsRealty or give us a call at 302-424-1890 to schedule your visit. So glad to know Tom. You have spoken with Bill Bell, my husband and partner. We look forward to helping you and Joanne when you are ready!